As always, it’s the most anticipated list this year! The Future Awards, described by the World Bank as “The Nobel Prize for Young Africans”, after unveiling its spectacular Young Person of the Year nominees earlier this week, has now released the full Nominees List for all 21 categories. Voting begins immediately! The voting numbers are 33120 (All networks) for Nigeria, and 1523 (Expresso & MTN), 1910 (Airtel) for Ghana. 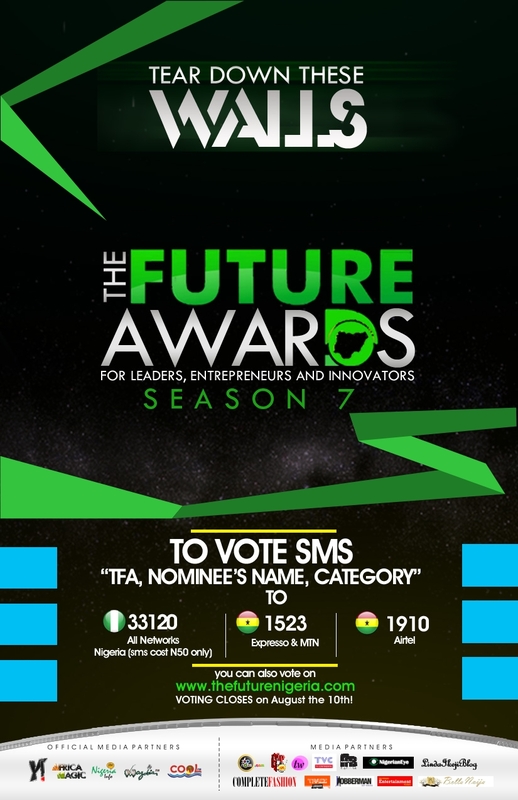 You can also vote on www.thefuturenigeria.com. According to the organisers, voting takes only 50% of the second stage of judging, so winners are not selected by voting popularity – there is a 4-stage judging process involving a Board of Judges and an Independent Audit Committee. There is also a one-week period for members of the public to make complaints about any of the nominees to the awards Central Working Committee (CWC). Please send complaints to [email protected]. All the nominees will be celebrated at an invitation-only media and VIP Nominees Reception on Saturday, 4 August 2012 – where they will also be inducted into the elite The Future Alumni Network. The Reception is also a yearly charity fundraiser – and this year, the event will be raising money for the Down Syndrome Association of Nigeria, a pioneering advocacy platform for children with Down’s Syndrome. Profiles of the nominees will be published on the official website www.ynaija.com/thefutureawards and on www.facebook.com/thefutureawards by July 31, 2012. Let the race begin! *Note that, due to the adjusted The Future Awards calendar (it was moved from its traditional January to August, the period in review is October 2010 – May 2012. Nominees who were still 31 years as at March 2011 (six months into the period in review) are therefore eligible. Excellent article! When they send me my invite, I'll connect with the account. Please i want to vote, how do we vote? and how do we vote? onyeka nwelue,Nominee for creative artist of the year is 24years old,and not 30years old please,the age how to change. How do we vote from the UK and US? We need update plz. I have search for the voting pull on TFA site but no luck. Also on here too but no luck. Where can we vote on-line? I want to vote…How do I vote??? When does it close? Pls how do we vote? There's no voting pull on your site. Please how do we vote??? When does voting start? We need clear example of how to vote. Also, the voting pull is not on your website. When does this come up? The Future Award is so inspiring, makes Youth be creative. Vector should have be nominated also in the Young Musician Category, the fella have really tired for himself.